By pressing the herein below button, I hereby recognize to have read and understand the sense, nature and extent of this limitation clause, to accept all its terms and conditions and to assume any and all liability of any nature whatsoever related to the use of any and/or all of the Calculation Tools..
Themis Multifactum’s Calculation Tool calculates your deadlines (days or weeks) and quickly adds them to your calendar with reminders or alerts and additions of notes. 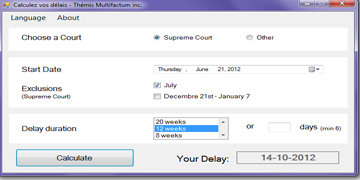 The application also takes leap years into account. 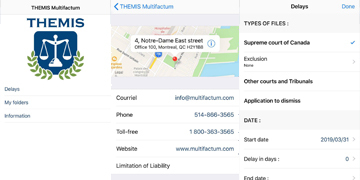 The "Supreme Court of Canada" option includes 3 modes of calculation. Set language in real time. Copyright © 2012 Thémis Multifactum inc.